This minimal modern wall sconce is perfect for any modern interior and it is also great for outdoor lighting. This stylish modern wall sconce is a mid century modern design classic! This wall sconce will provide the perfect harmonic balance with your modern home. Easy to install, durable and reliable, this wall sconce is the perfect fit for small residential- and large scale commercial projects. 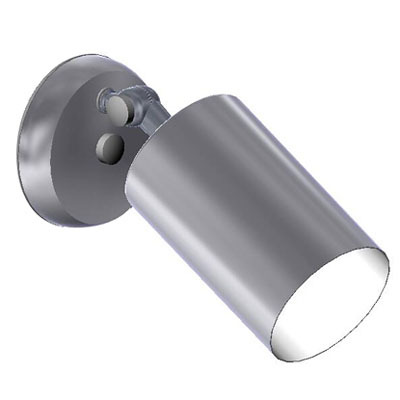 This modern sconce can be used as a ceiling light or wall sconce. Available in several color finishes: either satin aluminum (pictured), white, black, satin brass or bronze. Materials: aluminum cylinder and structure. Size of sconce: 6.75" long x 4.50" diameter.